Knoll FSC-certified workstations selected for the open plan space. At the helm of president Darren Walker, the Ford Foundation completed a renovation and restoration of its Midtown New York City headquarters that spanned three years. The building – originally designed by Kevin Roche, John Dinkloo and Associates in 1967 – consists of twelve-floors wrapped around a skylight atrium; it is constructed with granite, steel and glass. Widely revered as an architectural icon of late-American Modernism, the building’s exterior and indoor atrium received a landmark status, while the interior architecture did not. Led by Gensler, the Ford Foundation sought to shift to an open office plan while staying faithful to the original design. Knoll FSC-Certified workstations and Life Chairs furnish the newly renovated Ford Foundation for Social Justice. Image Copyright Richard Barnes. 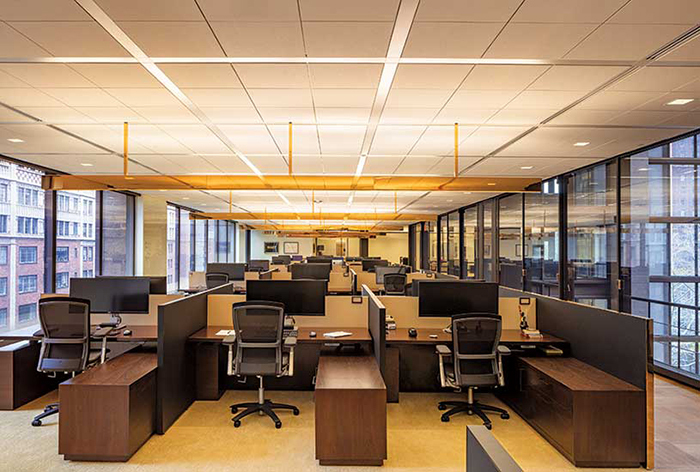 In the February 2019 issue of Architectural Record, editor Suzanne Stephens lauds the new Ford Foundation Headquarters and cites its shift to the open office plan as critical to the project’s success. “By switching to an open office scheme, the Foundation could gain two floors to rent out to like-minded not-for profits,” writes Stephens of the Ford Foundation’s inclusiveness in its design. “The philanthropy’s new name expresses these aspirations: the Ford Foundation Center for Social Justice.” In addition, the reconfiguration of space allowed for more meeting spaces, conference rooms and communal dining areas. Stephens also praises the redesign of the interior that, despite the major architectural changes to the floor plan, honors the original look and feel of the historic space. “Fabricated by Knoll, the 42-inch high custom cubicles are impressive: made of an FSC-certified mahogany and leather panels with brass touches, their design took cues from existing furniture and even elevator-cab details,” writes Stephens on the workstations and inclusion of the Knoll Life Chair. In addition to the faithfully devised workstations, Gensler restored 1500 pieces of furniture – more than half of which were designed by Warren Platner.